Congratulations to the librarians at Half Moon Bay Branch in San Mateo County, California! Their Noche de Cuentos 2013 event was a success! On March 15, Maria King and her 5th grade class met at the Half Moon Bay Library to celebrate the first “Noche de Cuentos” 2013. They had 110 people attending. “We are very proud of this program as students read their own stories.” Outreach Librarian Armando Ramirez told us. They also recorded the stories on video. Thanks Armando for sharing this! Do you have pictures of your own Noche 2013 event? Share them with us! Saturday January 26th, 2013 was a magic night in Seattle. The city hosted the American Library Association (ALA) Midwinter Meeting. As a complement to the association’s events, REFORMA (the National Association to Promote Library and Information Services to Latinos and the Spanish-speaking) organized a storytelling event at the Seattle Public Library. Margaret Read McDonald, Rose Cano, and Sonia Porras with her dancing troupe were the local performers. REFORMA was represented by its own Lucia Gonzalez and Oralia Garza de Cortes. And Sandra Rios Balderrama shared her poetic words as Mistress of Ceremony. Seattle’s Noche de Cuentos was dedicated to the memory of beloved Reformista and “poeta” tatiana de la tierra. In addition, the Mora Awards for “Dia de los Niños” programs were presented that same night. REFORMA thanks Information New Wave and Lorito Books for sponsoring the night, and the NW Chapter of REFORMA and the Seattle Public Library for welcoming the event on their beautiful building. Photos courtesy of Alma Ramos McDermott and Lucia M. Gonzalez. Beginning today, REFORMA is pleased to accept applications for NOCHE DE CUENTOS mini-grants. This year REFORMA partners with LORITO BOOK and Information New Wave (INW) as sponsors. 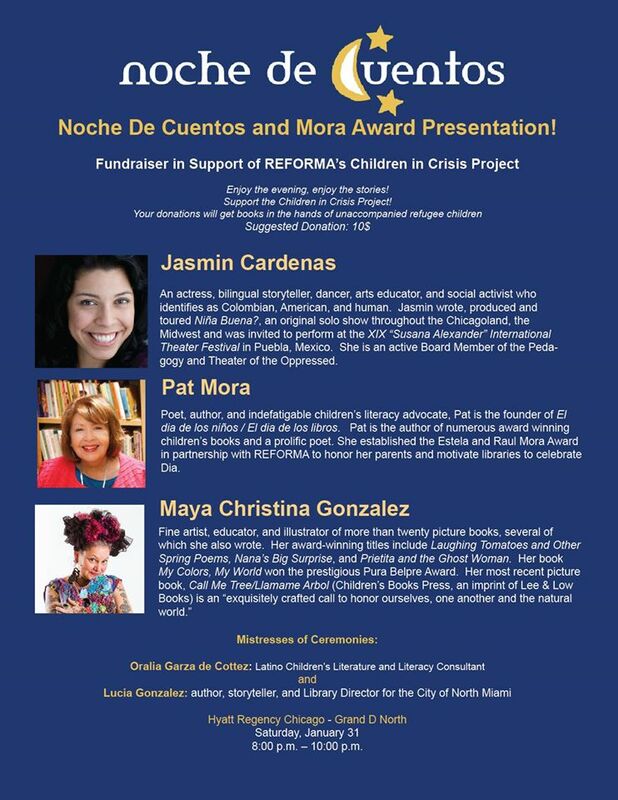 A $500 Mini-grant will be awarded to a library that plans an exemplary Noche de Cuentos event. In addition, a mini-grant for $250 will also be awarded. Applications will be received until January 31st, 2013. Noche de cuentos will be celebrated on the week of March 20-27, 2013 in conjunction with World Storytelling Day, observed during the spring equinox on March 20th. World Storytelling Day is a global celebration of the art of oral storytelling. The mission of of Noche de Cuentos @ mi biblioteca is to promote and preserve the art of storytelling within our Latino communities in the US. “Our language and our stories bind us together, they make us stronger.